This is the most important of the sanctuaries dedicated to Hera. The first, small-scale excavation of the site was conducted by Joseph Pitton de Tournefort (doctor and botanist) in 1702. In the 18th and 19th centuries, travellers visited the sanctuary and made drawings of the remains of the temple. 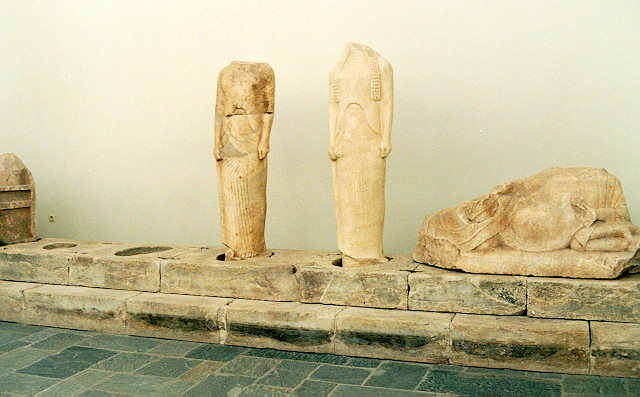 In 1879, at the NE corner, Paul Girard discovered the statue of "Hera" of Cheramyes, now exhibited in the Louvre. In 1902 and 1903 the sanctuary was again excavated by the Archaeological Society of Athens, under the direction of P. Kavvadias and Th. Sophoulis. In 1910 it was further investigated by Th. Wiegand and M. Schede on behalf of the Koenigliche Museen of Berlin but work was interrupted in 1914 by World War I. Systematic excavations were begun in 1925 by the German Archaeological Institute at Athens, under the direction of E. Buschor, were again interrupted in 1939 by World War II, resumed in 1951 and have been continued since then. Ionic dipteral temple built during the tyranny of Polycrates (538-522 B.C.). Only one column is still standing today, preserved up to half of its original height, while the foundations are preserved up to the base of the walls and the stylobate. Herodotus considered this temple as the largest in Greece. It follows almost exactly the contour lines of the cella and the pronaos of the older temple "of Rhoikos" (570/60 B.C. ), but it is much larger (108.63 x 55.16 m.). This difference in size is due to the addition of a third colonnade to the front and back of the peristasis, apparently following the example of the temple of Artemis at Ephesus, which had been built slightly earlier. The temple had a total of 155 columns, belonging to four different sizes and types. The entablature must have been made of wood. Since no tiles were found, it is suggested that the roof was never completed. Very large even in its earlier phases, occupied always the same position. Seven successive phases have been distinguished, of which the earliest, a small structure built of rubble, dates from the Late Bronze Age. The altar of the 8th/7th century B.C., for unknown reasons (possibly connected with the cult) was not placed on axis to the temple, but was orientated NW / SE. It acquired its monumental form in ca. 560 B.C., and was almost contemporary with the monumental temple of Rhoikos and Theodoros, placed on its axis. On the basis of the preserved foundations, its size is estimated to 36.50 X 16.50m. The temple opened to the main sacrifical area which was surrounded on three sides by a wall, 5-7m. high. This was decorated with impressive cymatia, and, on the interior, with a frieze showing fighting animals and sphinxes.The free edges of the two walls bear richly decorated anta capitals.In imperial Roman times (1st-2nd centuries A.D.) the altar was rebuilt of marble, and decorated with copies of the Archaic architectural decoration. 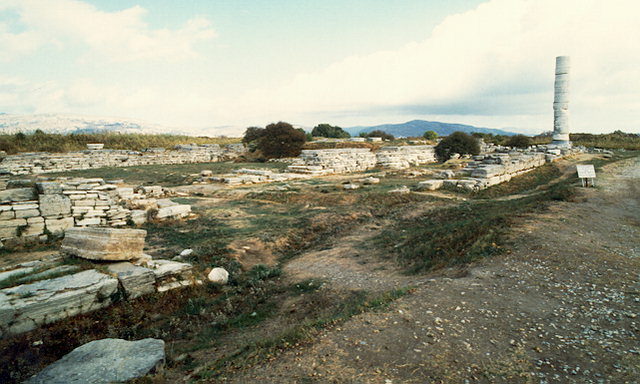 The road leading from the city of Samos (present-day Pythagoreion) to the sanctuary, was an important feature of the landscape already in the beginning of the 6th century B.C., at the latest.Being the main access to the sanctuary, it was adorned with votive monuments closely spaced along its whole length. The colossal marble kouroi, found on the road, and the Geneleos Group (a replica of which has been placed on the north end) give an idea of the magnificence of the site as early as the Archaic period. The massive stone lining of the road surface, parts of which have been uncovered up to the Pythagoreion, was constructed in about A.D. 200. 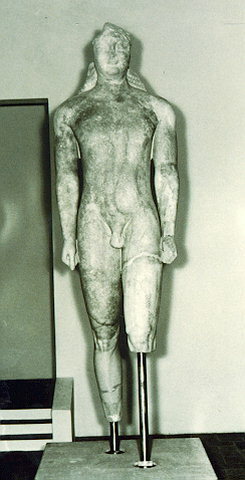 In 1980, excavations carried out in search of the main entrance to the sanctuary, brought to light the colossal kouros, now exhibited in the Samos Museum. Hecatompedon I is considered to be one of the earliest Greek temples, dated to the 8th century B.C. Because of its fragmentary state of preservation, however, the reconstruction is hypothetical. It is a rectangular, oblong building (length 33m., i.e. 100 feet, thus the name hecatompedon) with a 5 to 1 ratio of length to width, entered from the east. The walls were built of mudbrick on a stone crepis and a row of wooden posts resting on stone slabs along the central axis, supported the roof.The cult statue of the goddess stood on a simple rectangular base made of limestone slabs. In about the middle of the 7th century B.C. 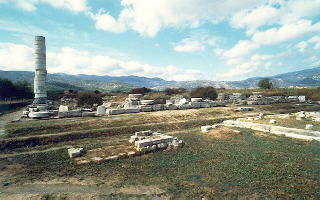 Hecatompedon II was erected on the foundations of its predecessor. The wall masonry was different and a peristasis of wooden posts on stone slabs was probably added, while on the east side there may have been two rows of columns. Both temples probably had gabled roofs covered with clay tiles. The southernmost temple of the sanctuary is peripteral, orientated to the NE. The cella and pronaos were divided into two aisles by a central colonnade and had the same lenght to width ratio as the Temple of Rhoikos: 1:3 (39.90 X 13.10). It is worth noting that the peristasis does not extend towards the east side of the temple, so that the facade is formed by the antae between very widely spaced columns. Fluted limestone columns are attributed to this temple, which was probably built in the middle of the 6th century B.C., but no matching capitals have been recognized so far.